The recent brutal slaying of a gay man in New York City had all the trappings of a national news story, so why was it ignored by major cable news outlets? On May 17, Mark Carson was shot in the face and killed while walking home in New York’s Greenwich Village by a man who pelted him with anti-gay slurs and asked, “You want to die tonight?” Carson’s alleged killer, Elliot Morales, reportedly laughed as he was arrested by police, bragging about what he had done. The incident highlights a recent spike in anti-gay hate crimes both in New York City and across the country. Days after Carson’s death, community members staged a massive rally against anti-gay violence featuring several city mayoral candidates. Carson’s death was also symbolically significant. The shooting took place just blocks away from the Stonewall Inn, considered by many to be the birthplace of the modern gay rights movement. And the brutal hate crime comes in the wake of growing acceptance of LGBT people, with three more states adopting marriage equality just in the past several weeks. But despite the significance of Carson’s death, cable news outlets largely ignored the incident, opting instead to continue obsessively reporting on the trial against Jodi Arias, a woman who has been convicted of murdering her boyfriend. So what explains the failure of major cable news networks to cover Carson’s story? 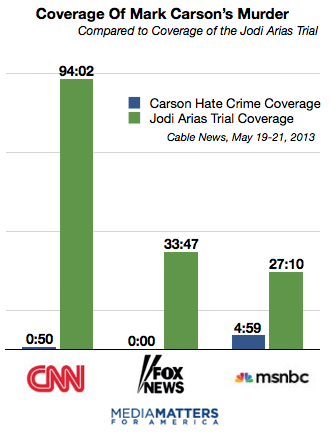 For some networks, the decision to ignore the Carson case and focus on the Arias trial likely has more to do with ratings than anything else. Arias’ plea to avoid the death penalty was a ratings gold mine for cable news networks, despite the substantive portion of her trial having been over for weeks. For Fox, ignoring Carson’s murder fits into the network’s larger pattern of downplaying anti-LGBT violence and harassment while peddling trivial anti-equality horror stories. But whatever reason cable news networks have for ignoring anti-gay violence, the result is the same: viewers fail to recognize the day-to-day challenges and threats faced by LGBT Americans, while anti-gay activists have an easier time promoting the bogus narrative that LGBT people aren’t actually a marginalized group.